Kathakali is one of the oldest theatre forms in the world. 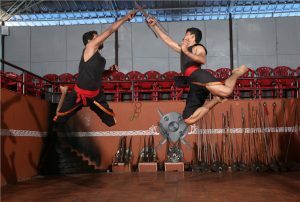 It originated in the areaof southwestern India now known as the state of Kerala. Kathakali is a group presentation, in which dancers take various roles in performances traditionally based on themes from Hindu mythology, especially the two epics, the Ramayana and theMahabharata. One of the most interesting aspects of Kathakali is its elaborate make-up code. Characters are categorized according to their nature. This determines the colours used in the make-up. The faces of noble male characters, such as virtuous kings, the divine hero Rama, etc., are predominantly green. Characters of high birth who have an evil streak, such as the demon king Ravana, are allotted a similar green make-up, slashed with red marks on the cheeks. Extremely angry or excessively evil characters wear predominantly red make-up and a flowing red beard. Forest dwellers such as hunters are represented with a predominantly black make-up base. Women and ascetics have lustrous, yellowish faces. 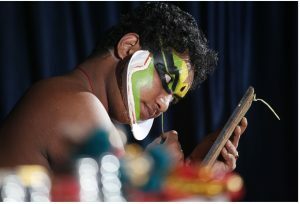 The technique of Kathakali includes a highly developed language of gesture, through which the artist can convey whole sentences and stories. The body movements and footwork are very rigourous. To attain the high degree of flexibility and muscle control required for this art, a Kathakali dancer undergoes a strenuous course of training, and special periods of body massage. The dancers wear large head dresses, and the contours of the face are extended with moulded lime. The extraordinary costumes and make-up serve to raise the participants above the level of mere mortals, so that they may transport the audience to a world of wonders. The orchestra of a Kathakali performance includes two drums known as the chenda and the maddalam, along with cymbals and another percussion instrument, the ela taalam. Normally, two singers provide the vocal accompaniment. The style of singing particular to Kathakali is called Sopaanam. The orchestra of a Kathakali troupe is unique and provides not only the background to the dancing, but also serves as a highly expressive special effects team. In the traditional village ambiance, the percussionists also provide publicity for the event by playing outside the venue for some hours before the start of the show.A traditional Kathakali performance begins in the evening and continues throughout the night, culminating at the auspicious hour of dawn, when Good finally conquers Evil. Today, however, it has been modified for the proscenium stage, and urban audiences can participate in this ritualistic theatre experience in the comfort of a plush auditorium, within the span of a couple of hours.